More challenges to come in the referendum planning process: As the successful registration process begins winding down, new threats to the referendum timeline and to peace more generally, begin to emerge. Still no deal on Abyei: The two parties accept the impossibility of holding a referendum in Abyei on January 9 and begin discussing various internationally-proposed options for the region. Minor progress on post-referendum negotiations: Mbeki announces the indefinite suspension of post-referendum talks this week, but the parties reach a minor agreement on oil. Prospects for a sustainable peace deal in the near future dwindle for Darfur: Violence continues to plague the regionas the various rebel groups pose new challenges to the government in both Doha and Darfur. Having been extended by one week, the voter registration period for the southern referendum ended on Wednesday in Sudan, though registration for some in the southern diaspora was extended again to make up for initial delays. Aleu Garang Aleu, spokesman for the Southern Sudan Referendum Commission, or SSRC, said that the registration process was a "success" and "peaceful." According to Aleu and the head of the SSRC, Mohamed Ibrahim Khalil, about 3 million southerners have registered to vote. Speaking in Khartoum on Wednesday, Khalil said that 40% of southerners had registered in the north, 60% in the south, and between 50 and 60% in the eight countries in which the diaspora is able to vote, according to the paper Al-Rai Al-Aam. Ballots for the referendum have still not been printed, however. With the vote about five weeks away, the SSRC announced that it was reopening the bidding process for printing companies in order to allow Sudanese companies to compete. While this prompted speculation over whether the referendum could be held on time, SSRC deputy chairman, Justice Chan Reec Madut, said that this would not affect the timeline. The British company Tall Security Group won the tender and has committed to delivering the ballots by Christmas day. Even as the SSRC head of information confirmed that the South would be ready for the referendum on January 9, SSRC head Khalil requested that President Omar al-Bashir and Vice President Salva Kiir delay the vote by a "few days" for technical reasons. Specifically, Khalil requested the delay to allow more time for objections and appeals regarding voter registration. However, a delay would likely inflame tensions between the North and South. Unfortunately, the SSRC continues to be woefully underfunded, which could threaten referendum preparations moving forward. The ruling National Congress Party, or NCP, and the Government of Southern Sudan, or GoSS, have both disbursed "some funds" but a “significant gap” remains. Also worrisome are attempts, allegedly by the NCP, to dispute the legitimacy of the registration process, as well as the growing concern that it will contest the outcome of the referendum. A leading member of the NCP said it will not recognize the results of the referendum, citing violations of the Referendum Act by the SSRC and the ruling party in the South, the Sudan People’s Liberation Movement, or SPLM. Rabie Abdelati Obeid said that a group of southerners has documented over 100 violations by the SSRC of the Referendum Act, including not taking action when the SPLM closed down several registration centers and allowing employees who are below the required age of 40 years to work at the centers. The group has reportedly filed a petition with the Sudanese Constitutional Court urging the court to disband the referendum commission based on these claims. Supporters of the SPLM, in response, have accused Khartoum of being behind the move to dissolve the commission, intent on thwarting the referendum preparations. The NCP has countered with claims that the SPLM has terrorized and intimidated voters. International observers, such as the Carter Center and the U.N. monitoring panel, have concluded that the process has been largely peaceful with some logistical challenges and irregularities. Meanwhile, the Sudan Armed Forces, or SAF, have been bombing areas in the South near the North-South border, which is serving to heighten tensions between the NCP and the SPLM. SAF admitted to carrying out bombing in Northern Bahr el-Ghazal state on November 14, alleging that it was following the Darfur rebel group the Justice and Equality Movement, or JEM, after fighting them in South Kordofan in the North. But SAF denied conducting further attacks on November 24 in the same area. According to SPLM secretary general Pagan Amum, SAF not only bombed Northern Bahr el-Ghazal again, but also proceeded to bomb Western Bahr el-Ghazal on Monday and Tuesday. GoSS’s minister of information said that the bombings disrupted registration in some areas and accused the NCP of intentionally trying to derail the referendum while secretary general Amum accused Khartoum of wanting to return the country to war. The NCP has responded by accusing the South of supporting the Darfur rebels and reaffirmed its intention to continue attacking the rebels, while taking steps to ensure that it does not violate the southern border. According to a report recently released by Aegis Trust, renewed violence in the South could cost more than U.S. $100 billion, with possible costs to Sudan of over $50 billion, to neighboring countries of over $25 billion, and to the international community in excess of $30 billion. To come to a credible and sustainable solution to the deadlock over the referendum for self-determination of the Abyei Area. As concerns rise among communities on the ground in Abyei and among international leaders and bodies, an agreement over the status of the contested border region has still not emerged. Following the signing of the African Union High-Level Implementation Panel, or AUHIP, Framework Agreement in mid-November, Sudanese President Omar al-Bashir and South Sudan President Salva Kiir have sat down together in public—at a long-postponed IGAD meeting which brought together East African leaders—and in private with AUHIP chair Thabo Mbeki to work out a settlement over Abyei. Though the 2005 peace agreement called for a referendum to give the region’s residents a chance to vote for whether Abyei would belong to the North or the South, conversation at the leadership level has largely moved beyond a solution that involves such a vote. According to Gration, the North maintains that Misseriya have the right to be part of the decision to determine Abyei’s status. In public, a similar posture has been conveyed. At the IGAD summit, President Bashir reiterated the government’s commitment to the Permanent Court of Arbitration ruling on Abyei’s borders, but noted that the government was “equally committed” to giving the right to vote to all residents of Abyei. More recently though, senior NCP official Nafie ali Nafie told al-Jazeera that a referendum will not take place. The option of annexing Abyei to the South appears to be the preferred path for the SPLM, whose officials have previously come out to say they are ready to pay the price for such an option. Agreement from the NCP will depend on the level of concessions that the SPLM is willing to offer—not only on the various unresolved post-referendum issues, but also on Misseriya rights, around which the NCP’s rhetoric has centered in recent weeks. Yet a compromise on the NCP side is unlikely to emerge until the eleventh hour even as Sudan sits less than a month away from January 9; the pressure of time could push the NCP’s southern partner into further concessions. On the ground, tensions are flaring between the Misseriya and Ngok Dinka communities whose members have assumed opposing postures in recent weeks. Ngok Dinka leaders have announced that they will hold their own referendum if an agreement on Abyei does not emerge by the end of December, and have threatened to block the Misseriya’s grazing routes if the referendum does not take place on time. In response, a number of Misseriya leaders have set up a parallel Misseriya government in the region which will rival the current administration in place and reportedly assume responsibilities on Christmas Day; ten ministers have been selected. Adding to increasing tensions in Abyei is the influx of Abyei returnees and reported armed movements in and around the area. Negotiations on post-referendum arrangements have continued at the committee level, with committees comprised of representative of both parties, with no major breakthroughs. Mbeki arrived in Juba this Wednesday for post-referendum talks, but for undisclosed reasons reportedly announced the “indefinite adjournment” of the talks on Friday. On the citizenship front, in his speech at the NCP consultative council President Bashir promised that the rights of southerners in the North would be safeguarded regardless of citizenship. Nevertheless, the citizenship status of Sudanese in the North and South remains unresolved. In an optimistic sign of the parties’ ability to align their positions over oil-related issues, senior SPLM and NCP officials—notably Vice President Ali Osman Taha and South Sudan Vice President Riek Machar—agreed early this week on the mechanisms for securing and protecting oil fields and workers. “The two sides agreed that oil will continue to flow before, during and after the referendum,” one official reportedly said. The past few weeks in Darfur have been marked by clashes between various rebel forces and the government, as well as by indications that the government is moving forward with its new strategy for the region, despite the continuing violence. While JEM claimed in late November that the Sudanese air force was conducting a week-long air raid in North Darfur, Abdel Wahid’s Sudan Liberation Army, or SLA-AW, clashed with government forces in Dogodussa, South Darfur. Some of the rebels loyal to the Liberation and Justice Movement, or LJM, claim that government forces also attacked them in the area east of Jebel Marra, but others within LJM deny this assertion. The LJM commanders do seem to agree, however, that clashes between LJM forces and ‘Janjaweed’ took place in the Mukjar area of West Darfur at the end of November, leading to the alleged capture of 14 militiamen. Tensions were also high between the farming and herding communities in North Darfur, after pastoralists began grazing their animals on farms surrounding Kutum. Despite the farmers’ appeals, the animals continued to graze, leading to violent clashes between the two groups at the end of November. Tensions were eased, however, between the Rizeigat and the Misseriya in South Darfur, where they signed another reconciliation agreement aimed at ending the long conflict between them. This agreement built on one from last June which failed to quell the hostility between the groups. Meanwhile, the government of Sudan appears to be laying the foundation for the implementation of its new Darfur strategy, despite the continued violence. The NCP has successfully secured financing from the Arab Organization for Agricultural Development for various projects in the region, including the building of schools, health care centers, and 25 model villages, and has established a committee, under the chairmanship of the ministries of interior and finance, to deal with displacement and returns issues. 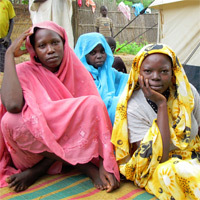 Yet at the same time, the government appears to be continuing its policy of suppressing independent reporting to the region—as seen by its most recent move to prevent Radio Dabanga broadcasts to Darfur—and of limiting humanitarian assistance, both to Jebel Marra and within the camps, which it still shows every intention of closing. According to one camp leader, "We think that the humanitarian affairs commission [is preventing the supply of] enough food because the government wants people to leave camps…This is a government policy. This is death by another policy." Relations between former senior presidential advisor Minni Minnawi, leader of the Sudan Liberation Army – Minni Minnawi, or SLA-MM, and the NCP have deteriorated rapidly in recent weeks. SLA-MM was the only group to sign on to the Darfur Peace Agreement in 2006, but recently began voicing its dissatisfaction over the fact that the agreement’s implementation has been limited – only 15 percent has been implemented, according to Minnawi. As a result, Minnawi rejected a security arrangement signed in Khartoum almost two months ago and called for the NCP to be removed from power. Police have since raided various SLA-MM offices, seized state resources from the group, and, according to one witness, have begun hunting for SLA-MM supporters in El Fasher, while SAF has declared Minnawi’s forces a military target. The NCP has also replaced Minnawi as chair of the Transitional Darfur Regional Authority, a position bestowed upon him in accordance with the Darfur Peace Agreement. Today the NCP claimed that it attacked Minnawi’s forces as they were moving towards South Sudan in an attempt to join the other rebel movements still fighting the government – but this remains unconfirmed. The negotiations in Doha are still underway, even as an all-inclusive, comprehensive deal seems more and more elusive. JEM has continued talking with the mediation team on the terms of its re-engagement in peace talks with the government, but the group’s ten requirements seem unlikely to be fulfilled, as mediators grow increasingly frustrated with the rebel group. JEM has requested, among other things, that the mandate of the peace process cover the Kordofan region, and has downplayed the significance of any deal between LJM and the NCP, saying that any deal that excludes JEM will not be successful in achieving peace. JEM has also announced in recent weeks that it intends on signing a unification charter with nine other Darfuri armed groups, claiming that a unification charter will help build a real alliance for Darfur, whether it be for peace or war, though many suspect that, despite JEM’s presence in Doha, they do not intend to negotiate a deal any time in the near future. Meanwhile, Abdel Wahid, the Paris-based leader of one arm of the Sudan Liberation Army, or SLA-AW, has begun consultations in various African capitals in preparation for a meeting in France that will address how to achieve a peaceful settlement for Darfur. Djibril Bassolé, chief mediator for Darfur, has come out in favor of giving the rebels more time to join the peace process, in the hopes that a broader, more inclusive agreement can be reached, but the government has rejected the idea, saying a deal must be signed before the end of December. Meanwhile, LJM and the NCP are continuing to negotiate but seem to have reached a sticking point over the creation of one administrative unit for Darfur, as opposed to three states. The mediation team for Darfur, including Bassolé and Qatari state minister for foreign affairs, Ahmed bin Abdullah Al-Mahmoud, traveled to Darfur in late November to promote the possible peace deal between the NCP and LJM. The team met with state officials, civil society leaders, and the displaced in the towns of El Fasher, Nyala, El Geneina, and Zalengei. Unfortunately, the trip was not without incident. In advance of the meeting in El Geneina, security agents reportedly warned participants not to make any demands regarding the creation of one administrative unit for Darfur or the appointment of a Darfuri vice president. In Nyala, protestors supporting the NCP disrupted the mediators’ meeting with the Darfuri displaced, while in Zalengei, a student protest outside the meeting place led to the deaths of two people after the police opened fire into the crowd. The U.N. Secretary-General, Ban Ki-moon, has called for an immediate inquiry into the deaths. Lastly, prosecutors at the International Criminal Court this week put forward the case against Abdallah Banda Abakaer Nourain and Saleh Mohammed Jerbo Jamus for leading the attack on 12 African Union peacekeepers in 2007.